BEIJING, Nov. 2 (Xinhua) -- President Xi Jinping held talks with the Dominican Republic President Danilo Medina in Beijing Friday, pledging to promote common development. China and the Dominican Republic established diplomatic ties half a year ago. 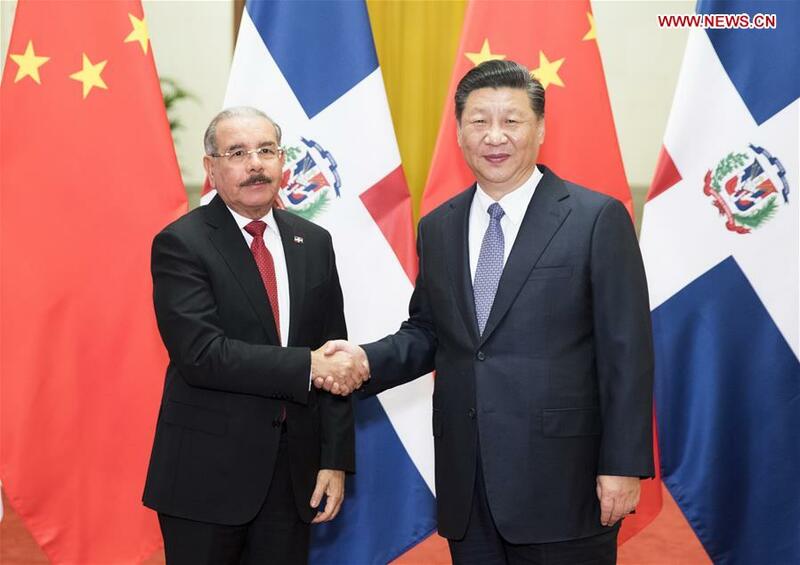 Xi said the decision of President Medina to establish ties with China conformed to the trend of the times and the historical inevitability, which allowed the Dominican Republic to have more than 1.3 billion Chinese friends. "Although China and the Dominican Republic have only recently established diplomatic relations, our hearts have long been linked together," Xi said. "The establishment of diplomatic ties between the two countries has given China a good partner with mutual respect, equal treatment and mutually-beneficial cooperation." He expressed China's willingness to work with the Dominican Republic to promote accelerated development of bilateral relations, turn the good vision of cooperation between the two countries into more tangible results, promote common development and bring benefits to the people. "History and facts will prove that the decision to establish diplomatic relations between China and the Dominican Republic is completely correct," said the president. The relations between China and the Dominican Republic have released a wellspring of vitality and shows the unlimited broad prospects since the two countries forged diplomatic ties half a year ago, said Xi. He encouraged both sides to enhance the top-down design and political guidance, calling on the Dominican Republic to adhere to the one-China policy so as to lay a solid foundation for the lasting and stable development of bilateral ties. He suggested that both sides strengthen overall planning and coordination to advance bilateral cooperation in various areas through partnership in the Belt and Road Initiative, and conduct cooperation in areas including infrastructure construction, finance, investment, tourism and aviation in the principle of a government-guided, business-led and market-driven approach for win-win progress. Xi expressed his welcome to Medina's participation in the opening ceremony of the first China International Import Expo (CIIE) scheduled for Nov. 5 to 10 in Shanghai, and called on the Dominican Republic to make the best use of the platform to promote its products. The president also encouraged both sides to intensify cultural and people-to-people exchanges and mutual understanding and to promote exchanges at high and local levels and from governments to legislature bodies so as to gain extensive public support for China-Dominican Republic cooperation. China stands ready to carry out cooperation with the Caribbean country in areas such as human resources training and sports, and will send medical teams there, Xi said. He also called for coordination on international affairs and joint efforts to safeguard international peace and security as well as the common interests of developing countries. Noting that China and Latin American countries, including Caribbean countries, are developing countries, Xi said both sides are at a similar stage of development thus providing opportunities for each other. Cooperation between China and Latin American countries conforms to the trend of the times and is the common aspiration and choice of both sides, he said. China-Latin America cooperation has been mutually beneficial and greatly promoted economic development and improvement of the people's livelihood in Latin American countries, Xi said. Medina expressed admiration for China's achievements in development and poverty reduction. Noting that the establishment of diplomatic ties with China is completely in the interests of the Dominican Republic, Medina said his country is willing to develop closer ties with China and deepen the friendship of the two peoples. "The Dominican Republic hopes to promote cooperation with China under the Belt and Road Initiative, in such areas as trade, infrastructure construction, energy, electricity and tourism," Medina said.